Nineteenth Century Pennsylvania Oil: An Overview. Illustrated. A brief overview of the Pennsylvania Oil Rush in the 1860's. After Petroleum describes a trip through the oil producing region in the 1860's. 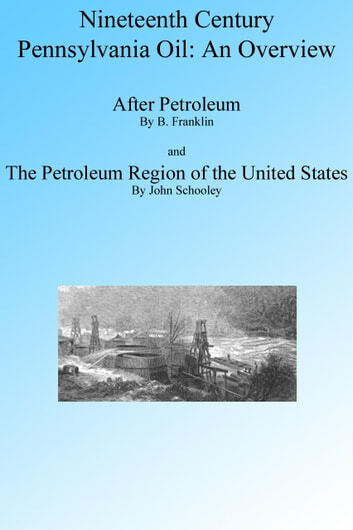 The Oil regions of the United States describes the geological and technical aspects of the era. Good contemporaneous reporting. Illustrated. Livres similaires à Nineteenth Century Pennsylvania Oil: An Overview. Illustrated. Inventors: (ILLUSTRATED) - Benjamin Franklin, Robert Fulton, Samuel F.B. Morse, Charles Goodyear, Eli Whitney, Thomas A. Edison, Alexander Graham Bell And MUCH MORE ! Silver Mining in 19th Century Nevada: Reese River Country, Illustrated. The Investment and Surrender of Port Hudson, Illustrated.